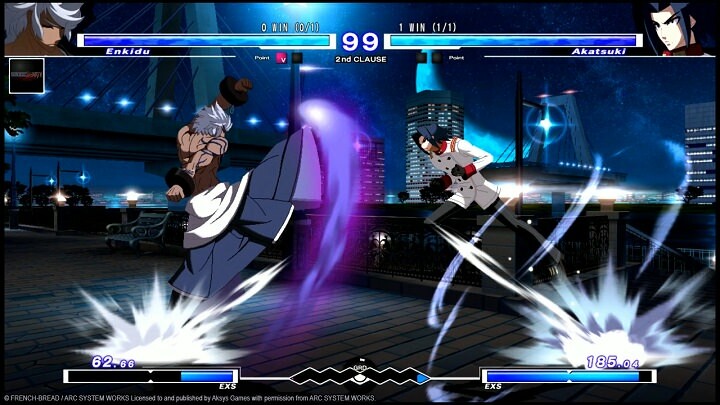 Clearly, the Japanese developer French Bread has given up any attempt at a coherent title with their newest fighting game rerelease, Under Night In-Birth Exe: Late(st). In spite of its self-inflicted and unfortunate naming choice, the newest Under Night In-Birth iteration remains steadfast as a fighting game gem amongst some pretty fierce competition. It is just a shame that it is highly likely to be buried by the recent Dragon Ball FighterZ (for a multitude of reasons) and possibly even redundant due to many serious fans having already imported this version of the series half a year ago. Those who are still curious as to what Under Night's second console release has to offer may notice its handful of new bells and whistles as it tries to justify its additional retail price tag. 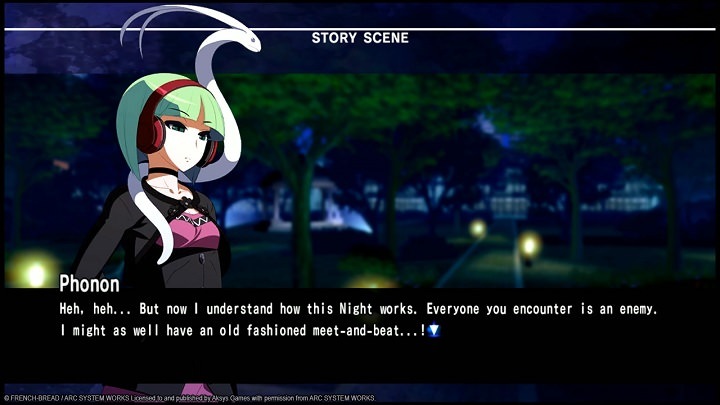 I would define the original PS3 release of Under Night In-Birth as having no unnecessary frills, yet also quite entertaining, and that it was only really held back by simply not explaining its nuanced fighting game system mechanics (such as "Chain Shift", "Veil off", and the likes). The lack of tutorials would essentially force one who wanted to give the prior game a fair shot to dig into online guides or wikis to understand the gameplay systems. This is no longer the case with Exe: Late(st) with many, many tutorials that are willing to teach in a very beginner-friendly manner, which range from simply moving around or looking at the health bar to going as deep as explaining concepts like "fuzzy guarding" in high-level play. It is a rather dry text dump based approach compared to Guilty Gear Xrd: Revelator's tutorial but the in-game insight is more than welcome nonetheless. It is all well and good that they added tutorials; however, features beyond that should be more enticing for returning players, such as new playable characters and modes. In addition to adding much-needed re-balancing from the prior game (Seth and Chaos are finally viable competitively! ), the four new playable characters themselves are all quite enjoyable and generally easy to pick up & play like the rest of the roster. Some are straightforward enough, like Enkidu, who is a close ranged fighter with various parrying skills to Phonon who keeps foes at bay with long-range whipping abilities. The more intriguing newcomers design-wise, however, are Mika -- who is a deceptively mobile fighter despite wielding two huge gauntlets -- and the lady Wagner, who has a fiery and hyper aggressive playstyle that is similar to her presence in the main story. Speaking of which, the newly added story mode may just be the worst part of the whole game. One could tell that the storytelling was not particularly noteworthy in the arcade mode of the earlier release; having an exhausting ten hour-plus visual novel story mode could not do this game fewer favors. As someone who tolerated the extensive visual novel narratives in various Blazblue games, it says a lot about just how dull and uneventful the Chronicles story mode in EXE Late(st) ends up being. At best, players will see some halfway interesting backstory regarding the playable cast. Yet, the far more prevalent theme is that it'll likely bore them out of their mind with incredibly mundane and redundant exposition that can stretch the course of five minutes into feeling like several hours. The worst part about the storytelling is that there is very little resembling a central narrative as whole making it feel that much more pointless to endure. The rest of the gameplay mode feature set is a matter of taking the good with the bad. For example, the "Mission" mode is neat in that it has players be able to learn actual viable bread & butter combos to more advanced techniques. Then there is the training mode which, despite being a total user interface nightmare, allows somewhat granular options in finding out which actions can easily be countered. The Network features remain to be much more mixed, however. In addition to being close to dead in terms of online presence (one of many reasons why the release date timing was unfortunate...), the online netcode itself is kind of dodgy and bare bones. There are the standard lobbies and ranked matchmaking, sure, but good luck finding fellow opponents or matches without noticeable lag. 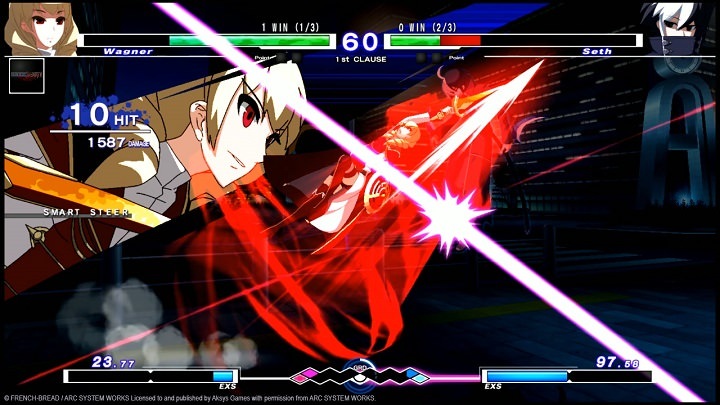 Under Night In-Birth EXE: Late(st) makes for a tricky recommendation in the modern fighting game climate. It's a criminally overlooked, and surprisingly approachable fighting game series though I find myself quite conflicted in how underwhelming Exe: Late(st) is as a re-release. The story mode is downright awful and whatever potential for longevity it has is sapped away by a weak online interface and an even worse release date timing thanks to the recent Dragon Ball FighterZ. What is left are a few neat additions such as the four entertaining new characters and the smart training mode options, as well as the solace in that would-be fans no longer have to go out of their to import the title, but little else. Under Night In-Birth EXE: Late(st) is stuck in the unfortunate position of being a really good fighter that is held back by an underwhelming overall re-release and terrible release date timing. But for those willing to accept Under Night In-Birth EXE: Late(st) as the diamond in the rough that it is should still have fun playing it.